Never in history has such a variety of foods been available to a society as Americans enjoy today. As the choices have increased, attention to food-related medical conditions has also increased. For millions of people in the U.S., food issues are a daily interference with a carefree diet. Whether it is a food allergy which prevents a person from eating a particular food altogether, or a food borne illness, it is very important to understand food-related health conditions. Many people believe that if they have a problem with a particular food, they are allergic to it. However, being allergic to a food and not being able to tolerate it are medically very different problems. A true food allergy is a response by the body’s immune system. The immune system interprets an ingredient in a particular food as an intruder, just as it would a virus or pollen. The body then releases histamines and creates antibodies against this intruder, which is usually a specific protein. While food allergy stories abound today, actual numbers for food allergy sufferers is fairly low. Approximately 5% of children have some sort of food allergy. Many of these are outgrown, as only 4% of teens and adults have a true allergy. The numbers for food intolerance are larger, as most people have consumed food that didn’t agree with them at some point in their lives. Recent research suggests that food allergies are a genetic trait. However, food intolerances are affected by more than just genes. Chemical additives to foods seem to trigger intolerances in many people. While a doctor is the best person to definitively diagnose whether a person is suffering from a food allergy or food intolerance, there are some ways to tell the difference. Someone with a true allergy to a food will usually react to it every time it is eaten, no matter how small the serving is. Someone who is sensitive or has a low tolerance for a food can often eat it in small quantities without any symptoms. Or they can perhaps not consume it too often in order to avoid issues. While all allergy symptoms are uncomfortable, some are even dangerous. Anaphylaxis is the most serious as it can be life-threatening. Anaphylaxis occurs when the entire body reacts to an allergen. When the allergen is detected, the entire body releases a substance called histamine, as well as other chemicals. This causes the airways to tighten, which can easily cut off oxygen to the lungs. Anaphylaxis requires immediate medical attention. Experts recommend that anyone witnessing an anaphylactic episode should call 911 and be prepared to administer CPR. Food allergies are usually diagnosed once symptoms have been noticed after eating certain foods. Doctors can run blood tests to determine that it is an allergy and not intolerance. There is no cure for food allergies. Once a diagnosis has been made, the person is advised to avoid the food altogether. This requires a diligent scrutiny of food labels, and often inquiries at restaurants to insure that the food won’t be consumed accidentally. 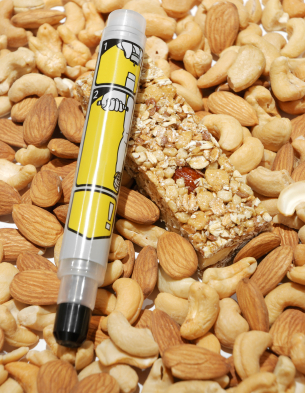 If the reactions have been severe enough, often the doctor will prescribe an epinephrine injector pen to be carried around to be used in case of ingestion of the allergen. While tests can be run to check for food allergies, food intolerance is generally diagnosed via an elimination diet. Any food suspected of causing problems is taken out of the diet. Once the person is no longer having issues, foods are slowly re-introduced to see which one is causing problems. Other people keep a food diary to keep track of symptoms to see if they occur when certain foods have been eaten. While these methods can take a while, pinpointing the offending food is key to making the appropriate diet changes. While food allergy sufferers must avoid their problem foods altogether, most people with a food intolerance are still able to consume theirs, but in smaller doses and not as frequently. This will usually require more label reading and caution when dining out. The restaurant server can usually be quite helpful if asked whether a certain ingredient is used in preparing a dish. Remember that not all ingredients are immediately apparent just from reading the description on the menu. The most common intolerance is lactose intolerance, or the inability to digest the protein in milk products. For people with this condition, an enzyme is available over-the-counter that, when taken with dairy products, helps supply the body with the chemicals needed to digest the milk. This product enables lactose intolerance individuals to enjoy an occasional small helping of ice cream or cheese. There is no cure for intolerance, however. Once symptoms occur, the best thing to do is to treat the symptoms, either with home remedies or drugs from a pharmacy, until the offending food is flushed from the system. While wheat is a common food allergen, there are people who cannot consume any wheat for a different reason. Patients with celiac disease must avoid gluten, the protein found in wheat and other grains, because their body has an autoimmune condition which attacks part of their digestive system when they consume it. Normally the small intestines are lined with hair-like villi. These projections absorb the nutrients from food. The immune systems of those with celiac attack these villi, causing extreme damage to these vital organs. This results in the inability to absorb necessary nutrition, leading to malnutrition. Celiac affects people differently, thus there are no definitive signs or symptoms. Diarrhea, bloating, and abdominal pain are most common. Many people lose weight and suffer from chronic fatigue. When a doctor suspects celiac, usually he will order blood tests and perhaps an endoscopy in order to get a sample of the small intestine for lab tests. At times, a camera pill is swallowed by the patient, giving the doctor a fuller picture of what is going on throughout the entire digestive system. While there is no cure, complete elimination of all gluten from the diet will eventually result in no symptoms and healing of the small intestine. Celiac disease is more common than once thought; in fact, over 2 million people in the U.S. have it. While no one knows exactly what triggers celiac disease, it appears to run in families. Also people with type one diabetes, autoimmune thyroid disease, Down syndrome, or microscopic colitis are at higher risk for celiac. It is important for anyone who suspects that he might have celiac to see a doctor, as, left untreated, it could lead not only to malnutrition, but neurological disorders and cancer. The majority of people in the United States do not have to deal with a food allergy or intolerance. Food poisoning is something nearly everyone suffers from at some point in life. Food poisoning occurs when contaminated food is ingested. The contaminants can be bacteria, viruses, or parasites which then infect the body. The contaminants usually come from one of two sources: food that has been exposed to something during processing or shipping; or food that has been improperly handled or cooked in the kitchen, like vegetables cut on the same surface as raw meat. Food poisoning can be mild to very severe, depending in the level of exposure. Symptoms usually included nausea, vomiting, diarrhea, and sometimes fever. This is the body’s way of flushing the invaders out of the body. Once this is accomplished, the symptoms usually subside. Doctors suggest drinking plenty of liquids in order to stay hydrated, but to slowly start back eating. Do not use over-the-counter remedies to stop the diarrhea as this will slow down the flushing of the toxins out of the body.